Solo Female Travel in Mexico — Is it Safe? Is it safe for a woman to travel alone in Mexico? ABSOLUTELY. Mexico gets a undeserved bad reputation for travel, particularly in the United States. Much of this is due to the cable news environment with its exaggerated narratives that Mexico is full of drug cartels and murderous immigrants. This is not what Mexico is actually like. In fact, the real Mexico is so different that you’ll be stunned. My name is Kate and I write about solo female travel for a living. And I’ve spent a lot of time traveling in Mexico. Even though I’ve been to 77 countries and all seven continents, there’s something about Mexico that pulls me back again and again. I literally got back from my last trip two weeks ago and I’m already trying to figure out when I can go back next! Mexico is one of my favorite countries — both in general and for solo female travel. If this is your first time traveling solo, Mexico is a great choice. 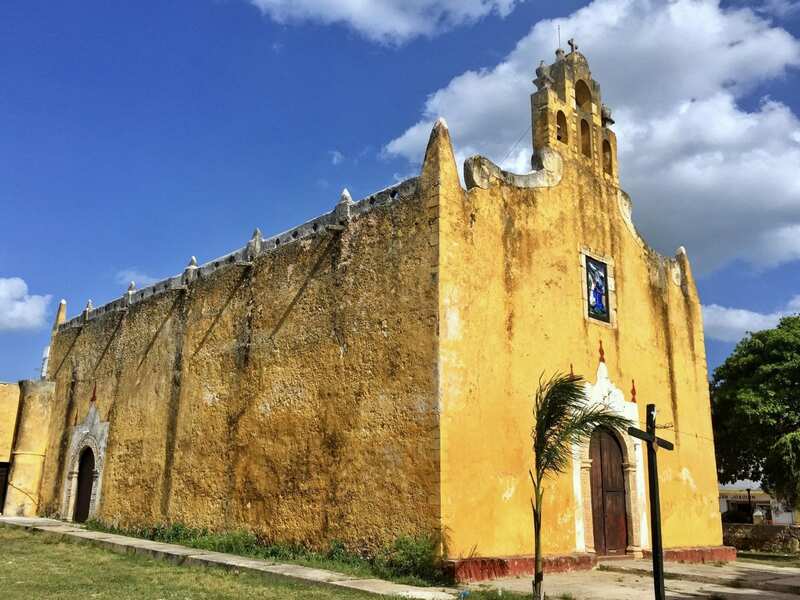 Mexico has good travel infrastructure, excellent hotels at a variety of price points, and several well-worn tourist trails, especially in the Yucatán. The food is familiar and delicious. English is spoken in touristy areas, but even when it’s not, Spanish is an easy enough language to pick up on your own. And the people are kind and helpful. My advice for first-time solo female travelers is to plan your itinerary carefully — especially transportation. Figure out where you’ll be staying ahead of time, plan your forms of transportation (whether you take buses, rent a car, book a shuttle transfer, or fly between destinations), and the tours and activities you’d like to do. And don’t skip on getting a SIM card (I get one from Telcel). It can help you with everything from GPS to translation. I usually advise travelers to be flexible with their itineraries, but I think first-time solo female travelers benefit from having more structure. If you’ve previously traveled solo, you’ll find Mexico to be an easy destination, especially if you speak some Spanish. But Mexico doesn’t have to be a lie-on-the-beach-and-don’t-leave-the-resort kind of destination. Whatever you’re into — cool cities, crazy scenery, diving or surfing or hiking — Mexico has everything in spades. See below for suggestions on where to go. As soon as you announce that you’re planning a trip to Mexico, one of your parents or relatives or coworkers will say, “Don’t go to Mexico — it’s not safe.” And that may give you pause, especially if the person is someone you love or respect. But you need to consider the source first. Considering the source is one of my top travel safety tips for women, and this is especially true for women traveling to Mexico. Most people have an opinion about Mexico, and if they’re not experienced in traveling the country, it’s likely a bad opinion informed by cable news. Does this person travel in my style of traveling (i.e. backpacking as opposed to resort travel)? Has this person been to this destination? Has this person been to this destination recently (in the past 3-5 years)? If the questions to all four questions is yes, then you’ve likely got a reliable source and should listen to him or her. If not, you should find someone who knows better. And I’m someone who knows better. I’ve been teaching women how to travel the world safely for nine years now, and I’ve spent a lot of time in Mexico. I designed this guide to dispel myths and help women enjoy their trips to Mexico. Here’s the most important part: CABLE NEWS DOES NOT GIVE YOU AN ACCURATE PICTURE OF WHAT IT’S LIKE TO TRAVEL IN MEXICO. Ever since 24-hour cable news debuted in the US, there has been a disproportional focus on horrors around the world, particularly in Mexico and the Middle East. And that goes triple for Fox News, a channel that frequently and blatantly lies to the public for the purpose of consolidating money and power, then avoids lawsuits because they’re branded as “entertainment,” not news. Reporting exclusively on horrors outside the US borders and never showing any of the good stuff does not show you anything about what it’s like to travel in Mexico. The good stuff dominates — but it doesn’t make for compelling news. But aren’t there drug cartels in Mexico? Yes, but as long as you’re not going to Mexico for the purpose of trafficking drugs, you are not going to be involved in that. How often do you waltz into drug deals in your home country? How often do you accidentally end up in a meth lab? How often do you get in the way of drugs being transported? Most drug cartels operate in areas nowhere near where tourists go. You’re not Walter White. They don’t care about you. But aren’t there caravans of immigrants? That’s not an issue for you and not a safety issue for anyone. The goal of migrants is to get to the United States safely. You likely won’t see any migrants if you stick to the tourist trail, and your chance of seeing a caravan is nearly zero. If you do, they won’t be interested in you. But most importantly, the reason why so many Central Americans are fleeing their countries in the first place is because America’s interventionist policies in Central America ended up leaving the region destabilized and dangerous. That’s a pretty racist thing to say. Rapists are everywhere, and nine times out of ten women are raped by men they already know. But I heard about something bad that happened in Mexico. Is it safe? I’m not saying that tragedies never happen to travelers in Mexico. They do happen — but they’re rare. Far rarer than the public would have you believe. The water in Mexico is not safe to drink. If you’re not used to Mexican water, drinking it can lead to illness. There are two ways around this: drink bottled or sterilized water, or sterilize it yourself. While most travelers in Mexico rely on bottled water, it creates a major waste issue. For this reason, I recommend you bring a reusable bottle and invest in a SteriPen water purifier (much better and faster than tablets). Alternatively, you can bring a LifeStraw, a bottle that purifies water as you drink it through its straw. Noise is more of a convenience thing than a safety issue. Mexico is loud. Church services blare music into the night. Firecrackers explode with regularity. Trucks drive down the streets with loudspeakers blasting advertisements. And bus rides always have movies playing at top volume. If you’re not prepared, the noise of Mexico can drive you insane. For this reason, I recommend you bring earplugs, and you may want to consider investing in heavy-duty earplugs. If you’re planning on working while in Mexico, you may be interested in noise-canceling headphones. Dress to blend in with Mexican women. Your goal is not to “pass” as Mexican — it’s to look like you’re a longtime resident, not a tourist. Dressing similarly to locals helps immensely with this. Mexican women, like many Latin American women, tend to wear long pants but don’t have qualms about showing more skin up top. It’s good to dress a bit more conservatively than usual, especially in traditional areas. If you’re visiting a church or religious site, cover to your shoulders and knees. You have more leeway in resort areas. Only wear swimwear at the beach. The Walking Company is my go-to for comfortable shoes that are cute; I strongly recommend black ABEO flats, which have fantastic arch support. Consider bringing a Speakeasy Travel Supply scarf. These beautiful scarves have a hidden passport pocket in them. I love these scarves (I even designed my own!) and they are so good at keeping your valuables hidden. They’re also extremely chic and they come in different fabrics for all kinds of climates. Get a SIM card. If your phone plan doesn’t work overseas (don’t roam, it’s crazy expensive), pick up a SIM card in the airport or in a shop on the street. This way you’ll always have internet on your phone in case of an emergency. I usually get a Telcel SIM card when I’m in Mexico. Keep your drinks close to you. Don’t take drinks from strangers and don’t leave them out when you’re drinking them. Watch your drink like a hawk. Don’t drink too much. Know your limits, and drink less than you usually do at home. Be in a state where you’re aware of your surroundings. Peel your fruits and vegetables. If you’re going to eat raw fruits or vegetables, make sure they’re peeled. Lock up your valuables in a portable safe in your hotel room. I do this with my Pacsafe Travelsafe and I consider it the most important thing I pack. Malaria is present in parts of Mexico. This is the Mexico malaria map from the Center for Disease Control in the US. Some travelers choose to take malaria pills and some choose not to. I’m not going to tell you what to do because that’s a conversation you and a medical professional should have. I recommend seeing a travel doctor. The zika virus is also present in Mexico. Here is a map. Zika should be a concern of pregnant women, partners of pregnant women, and women who intend to become pregnant soon, but if you’re none of those things, you don’t need to worry. Some destinations in Mexico, like Mexico City, are at a high enough altitude that mosquitos are not present and zika is not a factor. Again, this is a conversation to have with your doctor. Climates vary enormously in Mexico. It’s not all hot and tropical. I’ve had friends plan trips to cities like Mexico City and Guanajuato in winter, and they ended up freezing their buns off and buying a new wardrobe because they thought it would be summer weather like in Cancún. Do your research before you arrive. Do not take drugs, even if you’re a party drug enthusiast. First, drugs in Mexico can be cut with poisonous substances. Second, if you’re caught, the police are not forgiving. Do what you want at home. Mexico isn’t the place. Don’t be afraid of street food. Street food is life in Mexico, especially when it comes to tacos! Go where the crowds are; if there’s a line, it means the food is great and there’s high turnover. You may want to start with vegetarian food and slowly ease yourself into meat. Hide your money in multiple places. Only take a small amount of cash and a debit card with you when going out. Keep the rest locked up in your room. Make sure you bring multiple debit cards, too, in case one gets lost or stolen. Protect yourself from the sun and heat. Bring sunscreen and a hat. If you plan on snorkeling or diving, use reef safe sunscreen (Stream2Sea is a good reef safe brand). Hydrate constantly. Water is ideal, but coconuts are great for the electrolytes! Don’t forget your reusable bottle and SteriPen so you can drink the local water safely. Finally, invest in a guidebook. Even as an expert traveler in the year 2019, I love guidebooks. They’re filled with detailed information about everything from travel times between cities to medical clinics serving foreigners. I’m a Lonely Planet fan and I recommend Lonely Planet’s Mexico guidebook. I buy the digital version and store the PDF on iBooks on my phone. You can either buy the whole thing or individual chapters, which is great if you’re only visiting a small part of the country. Learn to surf. 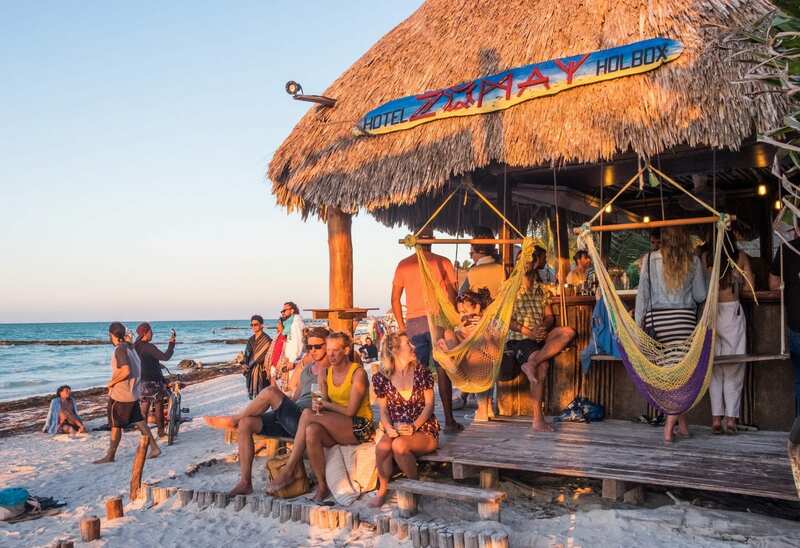 If you’ve ever dreamed of hanging ten, Mexico’s west coast is a great place to learn. I took a lesson in Punta de Mita and you might enjoy Sayulita, Puerto Escondido, or Cerritos. Have a world-class meal for a low price. Pujol in Mexico City is regularly ranked one of the top ten restaurants on the planet and while the tasting menu is pricey, you will pay far less than you would for a restaurant of that caliber in New York, Paris or Tokyo. Last I heard, the six-course lunch tasting menu was $128 in 2018. Catch a Lucha Libre match. This tradition, Mexican pro wrestling, is a fun and wacky night out! It’s all fake but it’s got so much drama. And the masks are fun. Swim in cenotes. 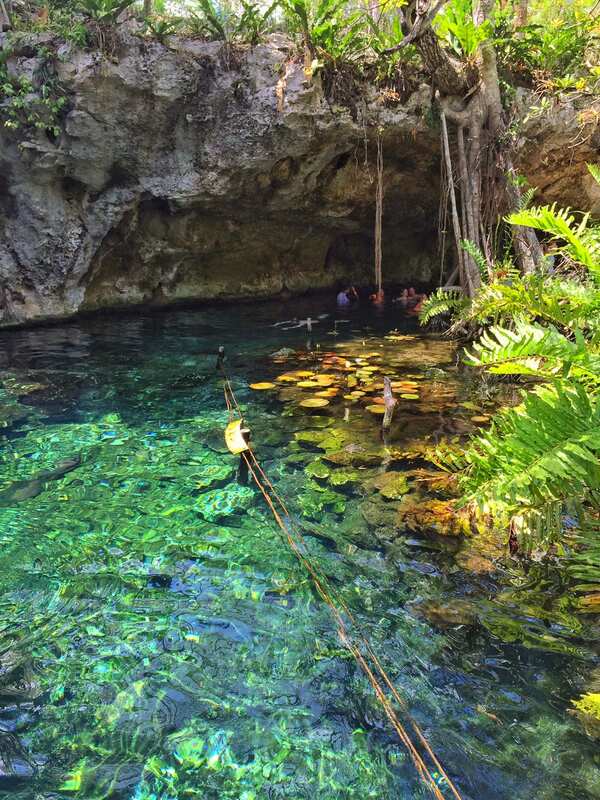 The Yucatán peninsula is full of cenotes — natural sinkholes created by collapsed limestone, revealing the fresh groundwater underneath. They’re amazing places for a cool swim. Shop in markets. From tiny markets in small towns to behemoths in major cities, Mexican markets are an adventure. Here you can find some of the best cheap dishes in town, as well as cheap clothing, fresh fruit, electronics, and all kinds of souvenirs. Get into Mexican nightlife. I love partying in Latin America more than any other region in the world, and Mexico is no exception — the music is joyful, the dancing is contagious, and the people are so welcoming. There is none of that pretentious club atmosphere you often get in the US. Experience Mayan Ruins. Mexico is home to some of the best Mayan pyramids in the world. 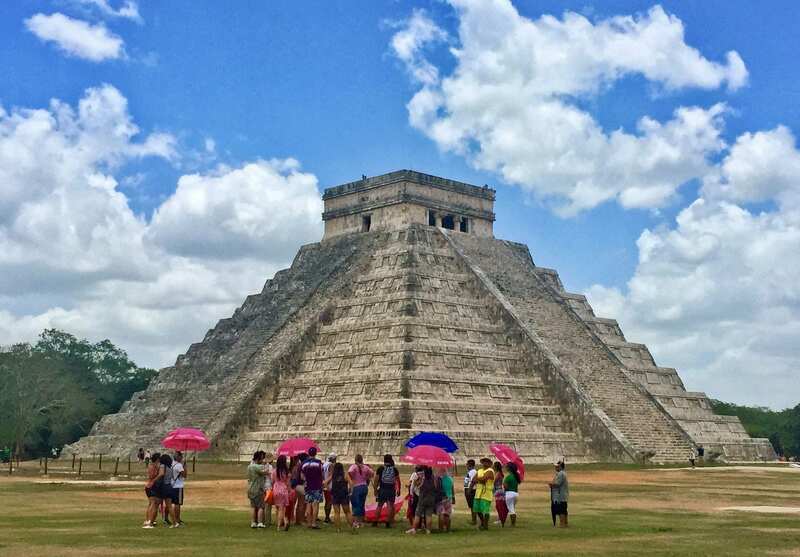 If you’re in the Yucatán, check out the Chichen Itza, pictured above. If you’re going to Mexico City, save an afternoon for Tehotihuacan. And if you’re traveling between San Cristobal de las Casas and the Yucatán, be sure to check out Palenque. Get up close and personal with whales. Baja California is renowned for its whale watching, but on the island of Holbox, you can go swimming with tiger sharks! Celebrate the Day of the Dead. From October 31 to November 2, Mexicans honor their departed relatives by spending the days with them at cemeteries, creating offerings for them. While the holiday is celebrated throughout the country, the best place to celebrate is the city of Oaxaca. The cities put on public celebrations, but keep in mind many Mexicans celebrate quietly and privately. Get dive certified, or snorkel like crazy. Cozumel is the best diving destination in Mexico, and it’s covered with gorgeous reefs. I really enjoyed snorkeling with sea turtles in Akumal. If you’re diving or snorkeling near reefs, be sure to wear reef-safe sunscreen. Learn to love mariachi. Mariachi bands are too often painted as a punchline in the States, but it is a gorgeous musical tradition. One of my favorite experiences in Mexico was randomly wandering into a karaoke bar and listening to everyone perform traditional Mexican songs. 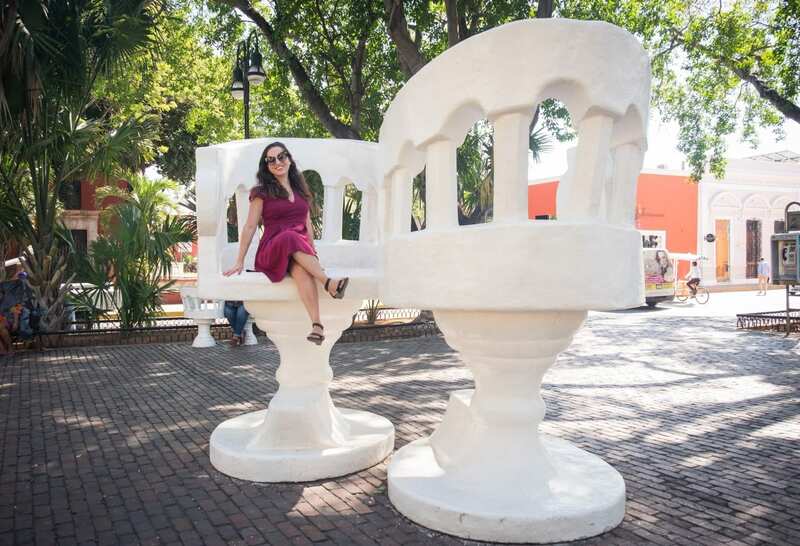 Read Mexican literature while on your trip. I recently read Laia Jufresa’s Umami while in Mexico, which takes place in Mexico City, and it is nothing short of sensational. A beautiful book, a gentle book, an easy-to-read book, and a book so gorgeously translated that you’ll be floored it was originally written in Spanish. Ah, here’s my favorite part of the post to write. There are so many amazing places to travel in Mexico! I keep adding more and more to my list! If you love beaches, Mexico is chock full of beauties. Many people head to Cancún and the surrounding beach towns of the Quintana Roo region — think Playa del Carmen, Tulum, the Riviera Maya. My favorite is the island of Holbox. Other great destinations are Baja California (think Los Cabos), the Riviera Nayarit (Sayulita and Puerto Vallarta are great), and the Oaxaca coast (check out Zipolite and Puerto Escondido). If you love cities, Mexico City is nothing short of spectacular. It’s filled with art, culture, an amazing culinary scene, and hip neighborhoods, all for a very reasonable cost. One of Mexico’s most visually stunning cities is Guanajuato, a few hours from Mexico City. 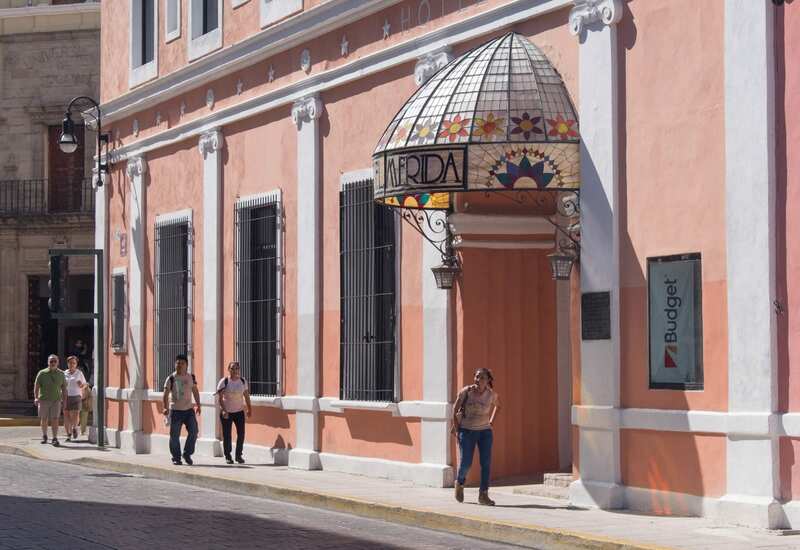 And I really love the smaller, low-key city of Mérida, the safest city in Mexico, home to unique Yucatecan cuisine. Oaxaca is a terrific city for both culture and cuisine. If you love road trips, Mexico has so much to offer. 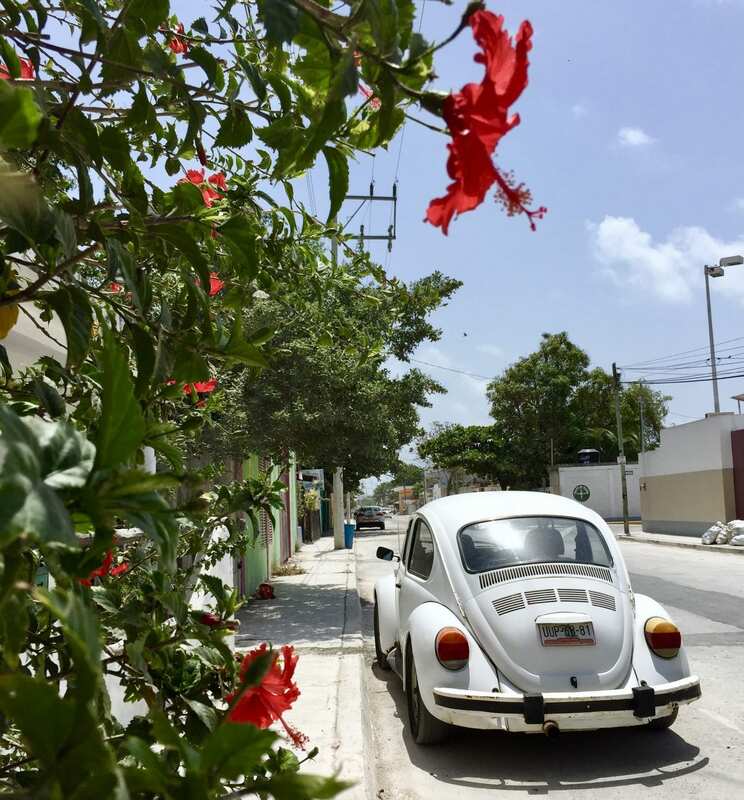 For first-time road-trippers, I’d recommend the Yucatán Peninsula. Fly into Cancún, rent a car, and explore the beaches, ruins, lagoons, and small cities along the way. 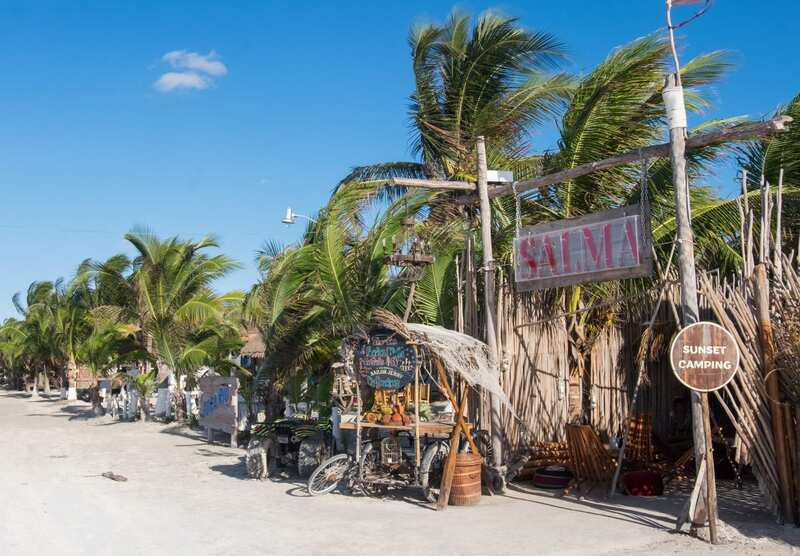 Hit up the yellow city of Izamal, the pink lakes of Las Coloradas, and the turquoise waters at Sian Ka’an Biosphere. Beyond that, set off on a trip connecting a few different cities. If you want to get off the beaten path in Mexico, you can definitely do that. One exciting trip further north is to Copper Canyon, where you can ride the train through some of the country’s most spectacular scenery. If you’re looking for an emerging city, check out Guadalajara and its excellent restaurants, bars, and breweries. The tequila fields of Tequila are a short drive away, too! And Bacalar, a lagoon in the Yucatán, is popular with Mexican tourists — but it’s just starting to become popular among the backpacker set. Travel insurance is vital for trips to Mexico — or any other country. If you get sick or injured on your trip, or even have to be flown home, travel insurance will help you in your time of need and protect you from financial ruin. And it’s not just about injury. If you get robbed, travel insurance can refund you for what was stolen from you. If your flights are cancelled due to weather, travel insurance can refund you. And if you have an emergency and need to get home immediately, travel insurance will help you get home fast. I use and recommend World Nomads travel insurance for trips to Mexico. Don’t be afraid — Mexico is waiting for you! I have had so many wonderful experiences in Mexico, and I want you to have those experiences, too! And trust me — once you’ve gotten into Mexico, it’s hard to tear yourself away. Even though I’ve been so many times, I keep planning trip after trip. I know you’ve got people in your life who think you’re crazy for wanting to travel Mexico alone — but you’re going to do great. Consider this your blessing. Read up on travel safety, go to Mexico, and have the time of your life. Then come back and tell me all about it. Have you traveled solo to Mexico? Have any travel tips? Share away! 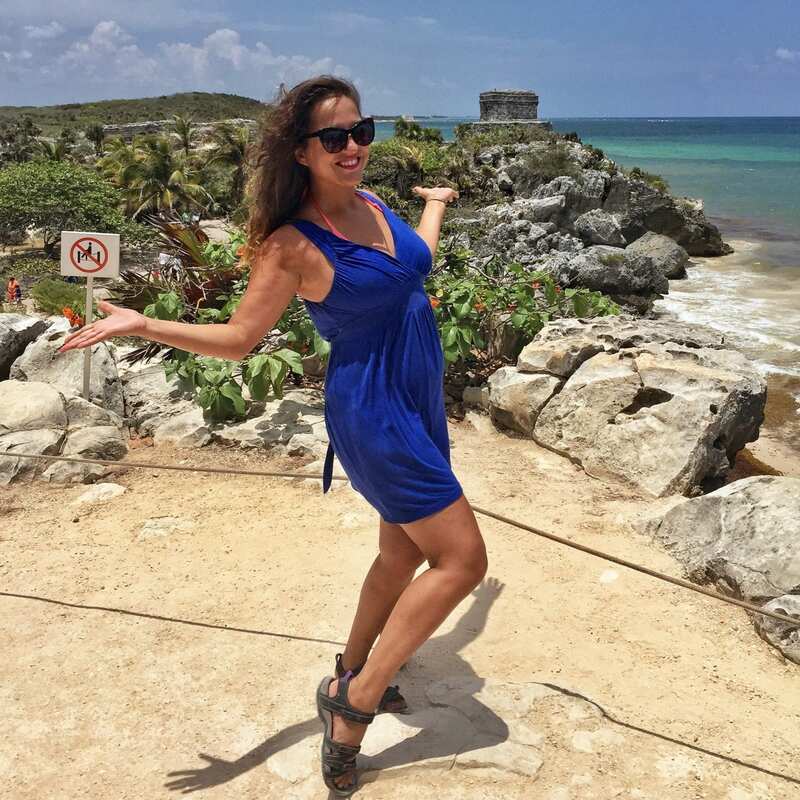 The post Solo Female Travel in Mexico — Is it Safe? appeared first on Adventurous Kate.